The Tennessee Turfgrass Association (TTA) has named First Tennessee Park and Nashville Sounds Head Groundskeeper Thomas Trotter as the recipient of the 2016 TTA Professional Sports Field of the Year Award. Trotter accepted the award at the 51st Annual Tennessee Turfgrass Conference and Tradeshow Tuesday night in Murfreesboro. Trotter recognized Sounds Assistant Groundskeeper Shay Adams and seasonal employees during the ceremony. 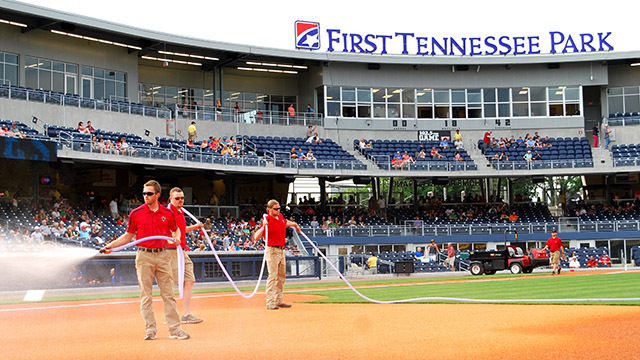 First Tennessee Park was chosen as the winner among all professional sports fields in the state of Tennessee with a natural grass playing surface which was nominated by industry peers. "Thomas Trotter and his crew are deserving of this award and we were pleased to present it to them," said TTA President Theo Lankford. In an effort of distinguishing fields across the state and gaining professional acknowledgment of its members, this award is based on special challenges faced and innovative solutions to playing surface problems, while also providing outstanding contributions to the turfgrass industry. "This award is very special to our entire grounds crew and a tribute to the effort put in on a daily basis," said Trotter. "We're grateful to the Tennessee Turfgrass Association for recognizing First Tennessee Park as one of the premier fields in baseball." Under Trotter's guidance, Greer Stadium won the same accolade in 2010. The 2016 season was Trotter's eighth as the Sounds Head Groundskeeper. The TTA serves its members in the industry through education, promotion and representation. The association supports ongoing programs in research, education, and extension in the area of turfgrass management that will benefit all individuals who manage turfgrasses or derive pleasure from the results of such management. The 2017 season will be the Sounds' 40th in franchise history and their third as the Oakland Athletics' top affiliate. Season ticket memberships are available now by calling (615) 690-4487 or by visiting www.nashvillesounds.com.